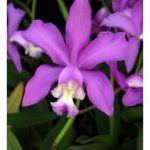 This bifoliate cattleya is one of the most popular cattleya species grown in Victoria, because of its ability to withstand low temperatures during winter, if kept dry at that time. In nature it is found near the coast of southern Brazil, Argentina and Paraguay, where it grows as an epiphyte or lithophyte in both exposed and shaded positions. Its inflorescences carry up to nine flowers that measure 10-11 cm across, and are usually pink in colour. The flowers are waxy and long-lived. 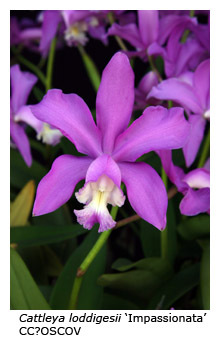 Although Cattleya loddigesii was the first cattleya species introduced into cultivation (at the Liverpool Botanic Gardens in England, in 1810), it was known as Epidendrum violaceum at that time. It was given the name Cattleya loddigesii only after the genus Cattleya was established in 1821, with Cattleya labiata as the type species. The Loddiges nursery, first established in Hackney (London) by Conrad Loddiges during the late eighteenth century, grew to great prominence during the early nineteenth century under the care of his son George. He built the largest hothouse in the world (at that time), and filled it with plants from all round the world. Reaching a height of 40 feet, it was equipped with a system that delivered “warm, mist-like rain to maintain beautiful tropical palms, epiphytic orchids, ferns and camellias in almost perfect conditions akin to a tropical rainforest”. George Loddiges began using Wardian cases to import orchids and other sensitive plants in 1833, and as a result he soon became a major supplier of orchids, just at a time when the hobby was rapidly expanding in popularity throughout Britain. The business closed in the 1850s, primarily because the nursery had been build on what had become prime residential land and its use for horticulture was no longer economic. The Loddiges family were responsible for introducing into cultivation many of the garden plants and trees that we now take for granted. In addition to Cattleya loddigesii, the Loddiges family is also commemorated by Cycnoches loddigesii and Dendrobium loddigesii.